This historical 1971 event set the template for every rock benefit concert that followed. A cast of all-star musicians, including Geroge Harrison, Ravi Shankar, Eric Clapton, Ringo Starr, and Bob Dylan, converged on New York City's Madison Square Garden to play and sing their hearts out, while all the proceeds from the concert went to aid Bengali refugees. 1971 UK 18-track triple LP box set, complete with a superb 64-page full colour photo booklet of the event & die-cut brown card inners. Formed in 1974, N.Y.C. 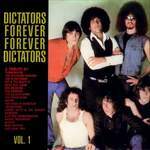 's Dictators were one of the finest and most influential proto-punk bands to walk the earth. Alternately reveling in and satirizing the wanton excesses of a rock & roll lifestyle and lowbrow culture (e.g., wrestling, TV, fast food), the Dictators, whose worldview was defined by bassist/keyboardist Andy Shernoff and renegade rock critic/theorist Richard Meltzer, played loud, fast rock & roll fueled by a love of '60s American garage rock, British Invasion pop, and the sonic onslaught of the Who. This 19-track tribute compilation ( 1 LP + 1 "7 ) collects performances by Turbonegro, Fleshtones, Nomads, Sator, Mad Daddys a.o. GUTBUCKET (AN UNDERWORLD ERUPTION) is a 1969 sampler album released to promote artists on the Liberty Records label, such as Captain Beefheart, Lightnin' Hopkins, Alexis Korner, Groundhogs, Canned Heat a.o.